File Photo – Actual rifle has unique Red, Silver & Blue “We the People” ATLAS S-ONE handguard (15”) and upper. 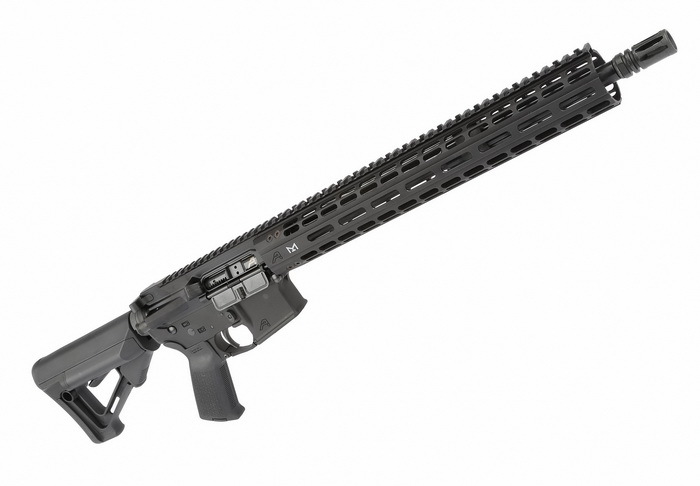 The Aero Precision M4E1 16" 5.56 Complete Rifle ($1,600) is built on the new M4E1 Threaded Series Upper Receiver. This upper combined with the new ATLAS S-ONE handguard mounting platform provides the shooter a light-weight, free-floated, rigid design resulting in superior performance and accuracy. This special rifle is built with a unique Red, Silver & Blue "We the People" an ATLAS S-ONE handguard (15”) and upper. All complete rifles are assembled by our professional gunsmiths and are tested prior to leaving our facility. The CTS-1400 Electronic Sight ($499) is a Compact Open Reflex Sight for Rifles and Shotguns. Featuring a 3.25 MOA round aiming dot and a wide field of view (FOV), the CTS-1400 will elevate your long gun's performance instantly. Easily user-installed the CTS-1200 includes a low-profile, snag-free M1913 Picatinny mount. This open reflex sight is covered by our 3 Year Protection Guaranteed warranty and our Free Batteries For Life program. The Crimson Trace CWL-202 ($99.99) is a powerful rail-attached tactical light for Picatinny rail-equipped long guns and provides up to 900 Lumens of white light. Experience the power that effective illumination can provide. Introducing Crimson Trace Tactical Lights, a best-in-class family of tactical lighting products for rail-adapted long guns, backed by the Crimson Trace reputation you trust. Manufacturing a great receiver isn’t just about what the end product looks like. It’s about what it feels like, how it works, how it handles and performs. To ensure that each and every one of these elements meets the mil-spec standard, we look at the process from which the product was created at a holistic level. We push the boundaries of manufacturing and challenge the status quo by constantly looking for new ways to use, develop or evolve existing processes. By personally designing and engineering state of the science tooling in-shop, we’re able to leverage the latest machine tool technologies to provide you with components of the highest quality. Better engineering builds better components. It’s just that simple.